KHARTOUM: Sudan’s military council chief Gen. Awad Ibn Auf announced Friday he was stepping down, just a day after he was sworn in following the ouster of veteran President Omar al-Bashir. “I hereby announce my resignation as head of the Transitional Military Council and the appointment of the person, in whose experience and suitability I trust to bring this ship to a safe shore,” Ibn Auf said on state television. The surprise move came hours after the military council promised a new civilian government. The council said it expected a pre-election transition to last two years at most or much less if chaos can be avoided. The head of the military council’s political committee, Omar Zain al-Abideen, also said the council would hold a dialogue with political entities. However, later Friday, the council said the meeting would be delayed until a later unspecified date, state news agency SUNA reported. The council also announced that it would not extradite Bashir to face accusations of genocide at the international war crimes court. Instead, he might go on trial in Sudan. Friday’s announcement of a future civilian government by the head of the military council’s political committee, Gen. Omar Zain al-Abideen, appeared aimed at reassuring wary demonstrators who went back into the streets to warn against imposing army rule after Bashir’s ouster. Worshippers packed the streets around the Defense Ministry for Friday prayers, heeding a call by the SPA to challenge the military council. The numbers swelled in the afternoon and a Reuters witness estimated hundreds of thousands of protesters thronged areas around the ministry, which was guarded by soldiers. “We do not reject a military council in principle, but we reject these people because they are from Bashir’s regime,” said Abdel-Hamid Ahmed, a 24-year-old doctor. Sudan’s Deputy U.N. Ambassador Yasir Abdalla Abdel-Salam Ahmad told the U.N. Security Council Friday that any democratic process in the country required time and called on the international community to support a peaceful transition. “No party will be excluded from the political process, including armed groups,” he told the council during a meeting on Abyei, a contested border region claimed by Sudan and South Sudan. The 15-member council convened later Friday behind closed doors to be briefed on the latest developments in Sudan. Zain al-Abideen said the military council would not interfere with a civilian government. However he said the defense and interior ministries would be under its control. Ibn Auf was Bashir’s vice president and defense minister and is among a handful of Sudanese commanders sanctioned by Washington for his alleged role during the atrocities committed in the Darfur conflict. “We will not dictate anything to the people. We want to create an atmosphere to manage a peaceful dialogue,” he added. 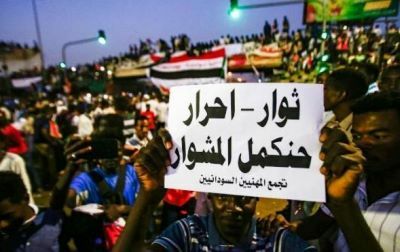 The council pledged to work with the new government to solve Sudan’s economic problems but warned protesters that the army would not tolerate unrest. “Protest is guaranteed, but it is forbidden to infringe on the freedom of others. We will be very decisive with whoever closes a road or a bridge,” Zain al-Abideen said.World powers, including the United States and Britain, said they supported a peaceful and democratic transition sooner than two years. China said it would continue to seek cooperation with Sudan regardless of the political situation. Ibn Auf said Thursday that Bashir was being detained in a “safe place.” Sudanese sources told Reuters that Bashir was at the presidential residence under heavy guard. Ibn Auf also announced a state of emergency, a nationwide cease-fire and the suspension of the constitution. He further said there would be a curfew from 10 p.m. to 4 a.m. But the council affirmed Friday it would not extradite Bashir, who has been indicted by the International Criminal Court in The Hague. Bashir is facing an arrest warrant over accusations of genocide in Sudan’s Darfur region during an insurgency that began in 2003 and led to the death of an estimated 300,000 people. He denies the allegations.